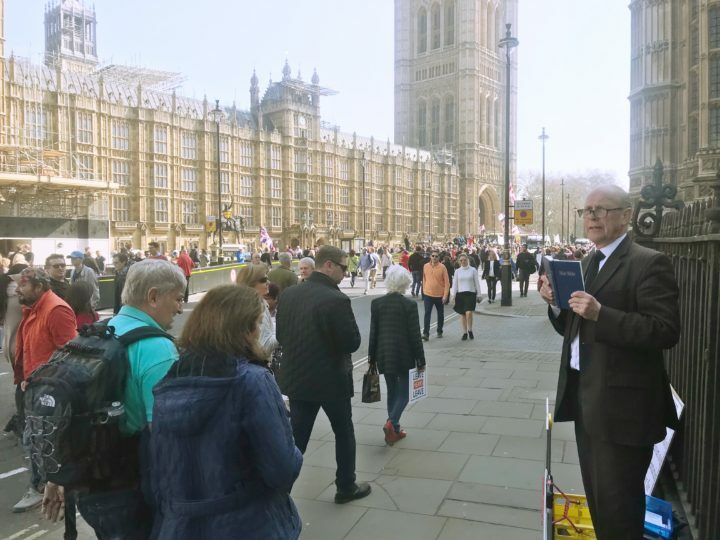 Pastors Peter Simpson and John Sherwood, aided by valiant Mrs Eve Hammond, were preaching the gospel outside Parliament yesterday, as the third crucial vote on Mrs May’s Withdrawal agreement was taking place. This was the day (March 29th) on which Britain should have been leaving the EU, and also the day of a major march and rally in Parliament Square. Therefore large numbers of people were present in Westminster, thus creating an ideal opportunity for preaching the gospel and setting forth the Biblical teaching on nationhood. Yet again enormous interest was taken in the special posters which had been put on display, including one which read, “Only God’s providence makes a nation prosperous, not its leagues and alliances. Therefore Britain needs a total break with the EU, along with repentance from sin and a return to faith in Christ”. Mrs Hammond carried this poster amongst the marching crowds. The whole environs of the Palace of Westminster were bedecked with posters and banners of one kind or another; yet someone came up to our brave octogenarian sister and said to her that hers was the best poster which he had read all day. One man got very angry at the gospel preaching, shouting out how unjust he thought God was, and another contemptuously called Pastor Simpson an ‘absolute fruitcake’ for daring to claim that it is the Trinitarian God who determines the destiny of nations. Another passer-by was incensed, because one of the posters declared that the LGBT agenda being promoted in schools was indicative of a nation in rebellion against God. The preaching also denounced the Government’s appalling redefinition of marriage. A professing Christian expressed astonishment that the Bible was being used to argue for national independence, when in reality it taught the opposite, namely the coming together of the nations of the world. Pastor Simpson then tried to go through the various relevant Scriptures concerning nationhood with this lady. The preaching in particular made reference to the time of the Tower of Babel, and how the Lord had dispersed the peoples of the world into separate nations as an antidote to their false religion and ‘one-world’ rebellion against Him. Because of the large rally taking place at Parliament Square, the road alongside the Parliament buildings was closed off, giving greater opportunity for preaching, and in God’s providence many were listening. Particularly encouraging was the time when Mr Paul Girvan, the DUP MP for South Antrim, made a point of coming over to the preachers to thank them for their presence. “I am a born again Christian”, he said, and he went on to assert how, amidst all the confusion in our national life, the providence of God is still overruling. How good it is to know that there are some truly regenerated followers of Christ in the House of Commons. Pastor Simpson told Mr Girvan how ashamed he felt that the Brexit negotiations had been conducted on the basis that Northern Ireland was not really part of the UK. Pastors Sherwood and Simpson carried on preaching until their voices began to give way, amplification not being allowed in the vicinity of Parliament. 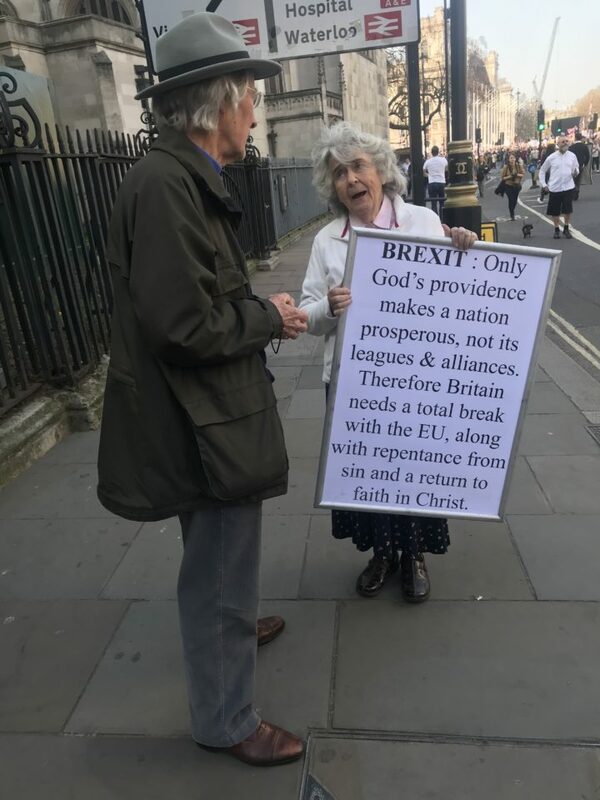 All the supply of specially prepared leaflets were handed out, these being entitled, ‘Britain needs a clean break from the EU and a return to its Bible-based Christian foundations’. 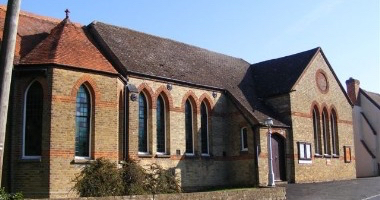 May the Lord now bring to fruition the seed sown in the hearts of many at Westminster. Whether those listening were for or against Brexit, they were told that the nation must return most urgently to the fear of the Lord. What Britain needs above all else on both a national and an individual level is the message of salvation through faith in the Lord Jesus Christ.